The literature of cryptography has a curious history. Secrecy, of course, has always played a central role, but until the First World War, important developments appeared in print in a more or less timely fashion and the field moved forward in much the same way as other specialized disciplines. As late as 1918, one of the most influential cryptanalytic papers of the 20th century, William F. Friedman's monograph The Index of Coincidence and its Applications in Cryptography, appeared as a research report of the private Riverbank Laboratories. And this, despite the fact that the work had been done as part of the war effort. In the same year Edward H. Hebern of Oakland, California filed the first patent for a rotor machine, the device destined to be a mainstay of military cryptography for nearly fifty years. After the First World War, however, things began to change. U.S. Army and Navy organizations, working entirely in secret, began to make fundamental advances in cryptography. During the thirties and forties a few basic papers did appear in the open literature and several treatises on the subject were published, but the latter were farther and farther behind the state of the art. By the end of the war the transition was complete. With one notable exception, the public literature had died. That exception was Claude Shannon's paper "The Communication Theory of Secrecy Systems," which appeared in the Bell System Technical Journal in 1949. It was similar to Friedman's 1918 paper, in that it grew out of wartime work of Shannon's. After the Second World War ended it was declassified, possibly by mistake. From 1949 until 1967 the cryptographic literature was barren. In that year a different sort of contribution appeared: David Kahn's history, The Codebreakers. It didn't contain any new technical ideas, but it did contain a remarkably complete history of what had gone before, including mention of some things that the government still considered secret. The significance of The Codebreakers lay not just in its remarkable scope, but also in the fact that it enjoyed good sales and made tens of thousands of people, who had never given the matter a moment's thought, aware of cryptography. A trickle of new cryptographic papers began to be written. At about the same time, Horst Feistel, who had earlier worked on identification friend or foe devices for the Air Force, took his lifelong passion for cryptography to the IBM Watson Laboratory in Yorktown Heights, New York. There, he begin development of what was to become the U.S. Data Encryption Standard and by the early 1970s several technical reports on this subject by Feistel and his colleagues had been made public by IBM. This was the situation when I entered the field in late 1972. The cryptographic literature wasn't abundant, but what there was included some very shiny nuggets. Cryptology presents a difficulty not found in normal academic disciplines: the need for the proper interaction of cryptography and cryptanalysis. This arises out of the fact that in the absence of real communications requirements, it is easy to propose a system that appears unbreakable. Many academic designs are so complex that the would-be cryptanalyst doesn't know where to start; exposing flaws in these designs is far harder than designing them in the first place. The result is that the competitive process, which is one strong motivation in academic research, cannot take hold. When Martin Hellman and I proposed public-key cryptography in 1975, one of the indirect aspects of our contribution was to introduce a problem that does not even appear easy to solve. Now an aspiring cryptosystem designer could produce something that would be recognized as clever--something that did more than just turn meaningful text into nonsense. The result has been a spectacular increase in the number of people working in cryptography, the number of meetings held, and the number of books and papers published. In my acceptance speech for the Donald E. Fink award--given for the best expository paper to appear in an IEEE journal--which I received jointly with Hellman in 1980, I told the audience that in writing "Privacy and Authentication," I had an experience that I suspected was rare even among the prominent scholars who populate the IEEE awards ceremony: I had written the paper I had wanted to study, but could not find, when I first became seriously interested in cryptography. 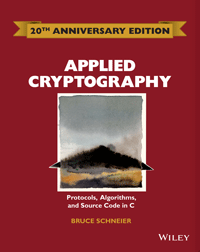 Had I been able to go to the Stanford bookstore and pick up a modern cryptography text, I would probably have learned about the field years earlier. But the only things available in the fall of 1972 were a few classic papers and some obscure technical reports. The contemporary researcher has no such problem. The problem now is choosing where to start among the thousands of papers and dozens of books. The contemporary researcher, yes, but what about the contemporary programmer or engineer who merely wants to use cryptography? Where does that person turn? Until now, it has been necessary to spend long hours hunting out and then studying the research literature before being able to design the sort of cryptographic utilities glibly described in popular articles. This is the gap that Bruce Schneier's Applied Cryptography has come to fill. Beginning with the objectives of communication security and elementary examples of programs used to achieve these objectives, Schneier gives us a panoramic view of the fruits of 20 years of public research. The title says it all; from the mundane objective of having a secure conversation the very first time you call someone to the possibilities of digital money and cryptographically secure elections, this is where you'll find it. Not satisfied that the book was about the real world merely because it went all the way down to the code, Schneier has included an account of the world in which cryptography is developed and applied, and discusses entities ranging from the International Association for Cryptologic Research to the NSA. When public interest in cryptography was just emerging in the late seventies and early eighties, the National Security Agency (NSA), America's official cryptographic organ, made several attempts to quash it. The first was a letter from a long-time NSA employee allegedly, avowedly, and apparently acting on his own. The letter was sent to the IEEE and warned that the publication of cryptographic material was a violation of the International Traffic in Arms Regulations (ITAR). This viewpoint turned out not even to be supported by the regulations themselves--which contained an explicit exemption for published material--but gave both the public practice of cryptography and the 1977 Information Theory Workshop lots of unexpected publicity. A more serious attempt occurred in 1980, when NSA funded the American Council on Education to examine the issue with a view to persuading Congress to give it legal control of publications in the field of cryptography. The results fell far short of NSA's ambitions and resulted in a program of voluntary review of cryptographic papers; researchers were requested to ask the NSA's opinion on whether disclosure of results would adversely affect the national interest before publication. As the eighties progressed, pressure focused more on the practice than the study of cryptography. Existing laws gave the NSA the power, through the Department of State, to regulate the export of cryptographic equipment. As business became more and more international and the American fraction of the world market declined, the pressure to have a single product in both domestic and offshore markets increased. Such single products were subject to export control and thus the NSA acquired substantial influence not only over what was exported, but over what was sold in the United States. As this is written, a new challenge confronts the public practice of cryptography. The government proposes to replace the widely published and available Data Encryption Standard, with a secret algorithm implemented in tamper-resistant chips. These chips will incorporate a codified mechanism of government monitoring. The negative aspects of this proposal range from potentially disastrous impact on personal privacy to the high cost of having to add hardware to products that had previously encrypted in software. It has attracted widespread negative comment, especially from the independent cryptographers. Some people, however, see more future in programming than politicking and have redoubled their efforts to provide the world with strong cryptography that is accessible to public scrutiny. A sharp step back from the notion that export control law could supersede the First Amendment seemed to have been taken in 1980 when the Federal Register announcement of a revision to ITAR included the statement: "... provision has been added to make it clear that the regulation of the export of technical data does not purport to interfere with the First Amendment rights of individuals." But that tension between the First Amendment and the export control laws has not gone away, should be evident from statements at a recent conference held by RSA Data Security. NSA's representative from the export control office expressed the opinion that people who published cryptographic programs were "in a grey area" with respect to the law. If that is so, it is a grey area on which this book can be expected to shed some light. The shift in the NSA's strategy, from attempting to control cryptographic research to tightening its grip on the development and deployment of cryptographic products, is presumably due to its realization that all the great cryptographic papers in the world do not protect a single bit of traffic. Sitting on the shelf, this volume may be able do no better than the books and papers that preceded it, but sitting next to a workstation, where a programmer is writing cryptographic code, it just may.